Introducing the famous Metropolitan Cupcakes! What?! 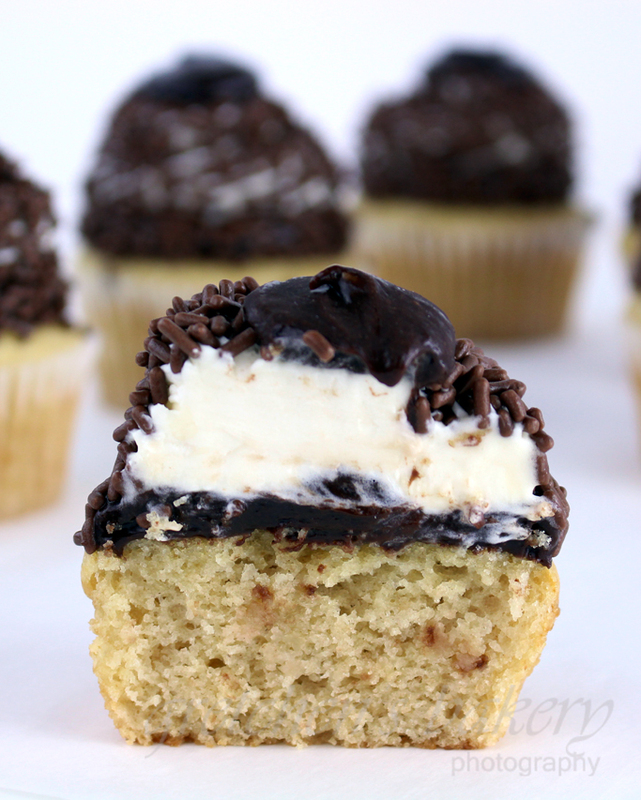 You’ve never heard of a Metropolitan Cupcake before? Well don’t feel bad, because neither had I! Check out my most recent vlog on youtube where I explain the backstory to this little creation and how I came about re-creating it. So technically I cannot take credit for it, since apparently the bakery in my hometown of Somerville NJ was the one to invent it; as well as the name. 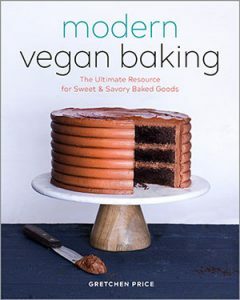 It is so interesting to me how there are classic and world renowned cakes and pastry; like the Black Forest, Gateaux Millefeuille, and even the cookies and cream has taken it’s rightful place in classic cake history, yet so many other’s remain unknown. This brought up the topic recently with a friend about how bakeries will invent a dessert, cake or pastry and name it whatever they want. It may become pretty well known in the town or even throughout surrounding towns over the years, but for the most part it stays a local favorite and secret. For example my Death to Diets cake from my bakery days is a good example of this phenomenon. Locally this cake was a hit and everyone knew about it! And well…of course those who follow my youtube channel also knew about! But for the most part unless you were a local or a follower of my youtube channel and blog not many other people had any idea what a Death to Diets Cake really was! That being said, you can pretty much invent anything you want, call it whatever you like and if you are lucky in a few decades your creation will go down in the annals of history! But for now, let’s just enjoy this little gem of a cupcake! Vegan vanilla cupcake, with a small ring of fudge icing, vegan buttercream, loads of vegan chocolate sprinkles and don’t forget the fudge dot on top! He noticed in so many of my videos my yields are always really weird. Like 8 cupcakes, or 11 or 14…. LOL! I wonder have any of you ever thought the same!? Well, the answer to that question is because I am taking giant, commercial bakery recipes, scaling them down for home use. So sometimes the yields get all jammed up and I can’t get it exactly to a perfect bakers dozen! Yes, you must watch my vlog video to understand that the heck I am talking about here! Ok but for now let’s just get to the recipe! For the cupcakes: First combine the vinegar with the soy milk to sour, let stand for about 5 minutes. Sift all the dry ingredients including the egg replacer together in a large mixing bowl. Cupcakes can be stored at room temperature in a cool place for up to 3 days. For longer storage or in higher temperatures (above 74°F) keep refrigerated for up to 1 week. 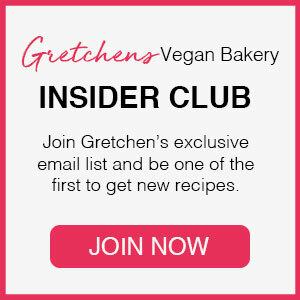 Hi gretchen, what is the alternative for those vegan ingrédients please ! Hi Gretchen! These look great! I’ve been spending weeks reading all your blogs and recipes and even mosied on over to your regular gretchens bakery website, and I have a question for ya! I’ve been on the hunt for a good vegan vanilla cupcake. A versatile one I can build lots of types of flavors with. I see you have this one, then another vanilla cupcake recipe on your ‘Vanilla Fudge cupcakes’ and another one that is right after your vegan chocolate cake recipe(the one you made for your mom when visiting blog story one haha), WELL my question is what is the difference in texture and taste! I want the best but don’t want to make all three. Hahaha, Thank you for your time hope to hear from you soon! Hi Norma! Good memories! Thank you! !